Old postcards written by people who are dead. In pencil. In pen. Something remains. Something intimate. A snail trail. A trail from someone, as if excreted from their own fingers. The first time I opened a box of letters written by the artist David Bomberg – right at the start of my research on him – I cried. I sat there in the Hyman Kreitman Reading Rooms at Tate Britain and was overwhelmed by a weird mixture of sadness and exhilaration. It had a lot to do with seeing Bomberg’s handwriting, his mark on the page, something to do with the intimacy of it all, letters to his wife, his struggle for recognition, everything exposed and now available for strangers to read. I am a staunch handwriter. I believe in handwriting and its power to take us, more than the keyboard can, to those deep places where stories take shape, or more accurately, where stories find their shape. Handwriting is the closest we can get to the voice behind the voice. It’s something deeper than the sounds we make when we open our mouths. I’m convinced of that. We can say things when we write by hand that we just wouldn’t or couldn’t when we speak. Handwriting is an expression of our most secret self, even when we’re not sharing secrets, even when we’re not exposing ourselves. And yet I write this on the keyboard. The Clissold Park postcards I’ve been collecting off eBay – 14 in total, so far – feel like an intimate glimpse into the lives of people who lived in or visited the area. I wrote a bit about three of the postcards in an earlier post. Our marks on the page tell something about us in the way that our DNA does. As if our blood and sweat were left to dry on the page. Why blue for ink? To distinguish it from blood. There will come a time in the future when we will not be taught how to write, when it’ll be enough to know how to spell, more or less, and know grammar, more or less. The handwriting on these postcards is an historical imprint, like the fossilised backbone of an insect in amber. Paper is the amber that preserves the writing. Handwriting needs paper like our feet need the ground. Paper is earth; our desire to narrate – the gravitational pull. Pen on paper is the gentle engraving of the nib on a smooth surface. These almost invisible grooves like the ink’s shadow. Paths across an expanse, lines of desire. Surfaces across which we move, to leave a mark, like scars on skin. The way our scars are stories; the marks – evidence of life and survival. And if we translate the scars into words, a story appears, a tale of a place, a wish, an encounter, a story of failure and success. A survival myth. Like paint on canvas. Like chalk and charcoal on the walls of a cave. Like chisel on stone. At the British Library today. The scroll of Kerouac’s On the Road displayed. Best viewed on your knees. But even this, the whole roll of it, isn’t as exciting as the handwriting on the back of one simple postcard from 1905. Maybe everything they’ve put up around the scroll isn’t that exciting and it would have been enough to have the scroll alone. 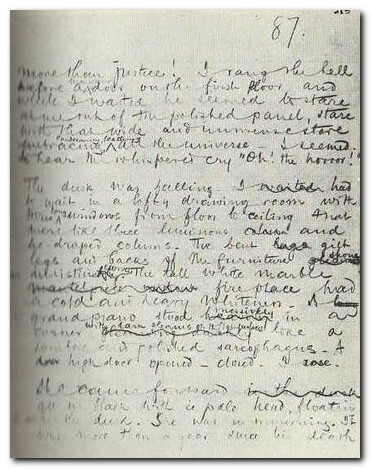 The way a page from Conrad’s Lord Jim is enough to excite, just to see how he crosses out lines, waves across the page, like in a child’s drawing of the sea. Even the typewriter is not quite it. You have pushed the keys, hacked away, but you have not pulled, not carried the pen across paper, not walked across earth. If it wasn’t for the edges of the page you would have to get up, to walk the pen, follow it, your hand gradually moving away from your body until you are forced to rise from your chair – to fly! to fly! – or with your other hand, to keep pulling the paper across the table, the way you sometimes do with a table-cloth or a sheet when you can be bothered to do the ironing. 4. ? July, 190?. Addressed to Miss Fletcher at 28 Briarwood Rd, Clapham Park, SW. dear Mabel how are you getting on all alone. got here safely and the weather is perfect – + have – found plenty of carrots? so you can have a good feed when you come. I hear that your grandmother can have you, so you will be alright when you come to this lovely place. Mother is just the same. Love from E?